BOB KIMBLE, 2/23/24-6/18/07, founder of Kimbo Educational, started his dance career at the age of 5, when he was a precocious performer at his Kindergarten class. He studied dance first in his local town and then on to New York. He joined the chorus of Something For the Boys with Ethel Merman in 1943. However, before long they lowered the draft age, so Bob’s Broadway career was shortened when he joined the Navy where he served until the end of the war. After the war, Bob enrolled in college and at the same time, opened a dance school in his mother’s basement. He earned the reputation as a gifted dance teacher specializing in children’s instruction. Bob quickly outgrew his mother’s basement and relocated to the town center. 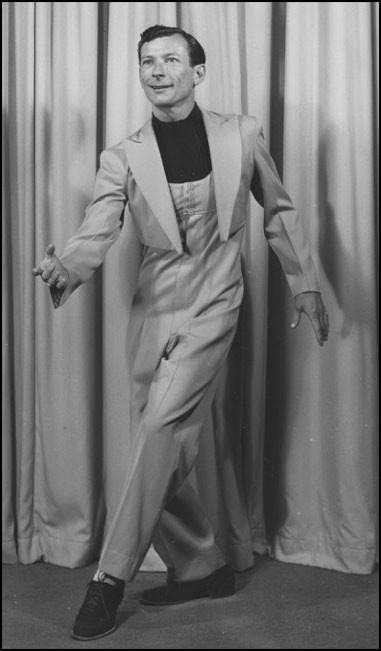 In 1954 he was invited to teach at a Dance Educators of America convention in New York. He had 3 homemade practice records with him, but when he finished his class everyone wanted to buy the records. Names and orders were taken and Kimbo Records was born. A step back - he met Gert in 1948 and they married in 1950. Gert quickly became part of the business. Jeff was born in 1951 and Jim arrived in 1956. The dance schools continued to grow along with Kimbo Records. Bob was kept very busy touring the US teaching at dance conventions and promoting his dance records. In 1962, the business expanded, thanks to President Kennedy’s emphasis on physical fitness. By adapting the dance routines to movement and exercise, a new product was formed for the physical education market. Then new markets in education were pursued mainly in the early childhood area. The company became Kimbo Educational, the Children’s Music Company, and is today, Kimbo records are distributed world-wide. There are over 300 CDs all with accompanying guides written by educators and covering such areas as singing, rhythmic activities, aerobics, fitness, dance, special ed, lullabies, science, math, and using manipulatives such as bean bags, parachutes, rhythm sticks, ribbons, scarves and much more. Kimbo Dance Records continues today. In the early ‘60’s Kimbo purchased the Selva line of dance records and added to their catalog a complete selection of classical ballet records. Over 50 minutes of your favorite Kimbo 45s! Dancing Cuddle Bug, Aristo-Cats, Mother Goose Parade, I Wuv a Wabbit, Parakeets in Tap Shoes, Leopard Cats, Ellie the Elf, Chicken Pox for Christmas, & more. Exciting selections of over 40 minutes of Kimbo hits to liven up your baby classes. Includes Left Foot- Right Foot, Tick Tock The Happy Clock, Little Apple Tree, I Must Practice Every Day, and more. Over 40 minutes of Kimbo hits ideal for your baby classes. Includes Plie & Relev, Watch Me Kick, Balanc, Skipping, Bunny Rabbit Blues, 5 Positions All In A Row, Deodorized Skunks, & more. Over 40 minutes of your favorite Kimbo 45's now on CD! Novelty, Tap, Baby! I'm Ready for the Show Tonite, Tappin' Out a Merry Beat, Ice Cream Treat, Fancy Dance Parade, Animal Talk, & more. Over 40 minutes of Kimbo hits for your baby and beginner classes. Tap, Novelty, Ballet! Elegant Elephant, You're Just Happy, That's All Scarecrows, We Come From Mars, My Dancing Doll, & more. T.V. That's for Me, I'm a Dingbat, Brand New Baby, Penguin Cha Cha, Charleston, and more.